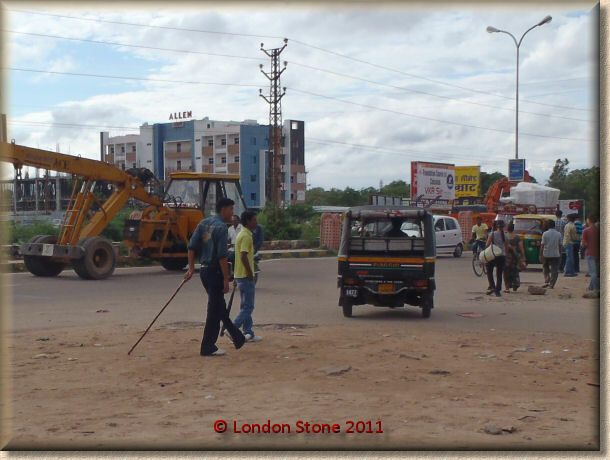 I have travelled to India on numerous occasions over the past 5 years but this recent trip was to be a first for me. I would be travelling in the Monsoon season. 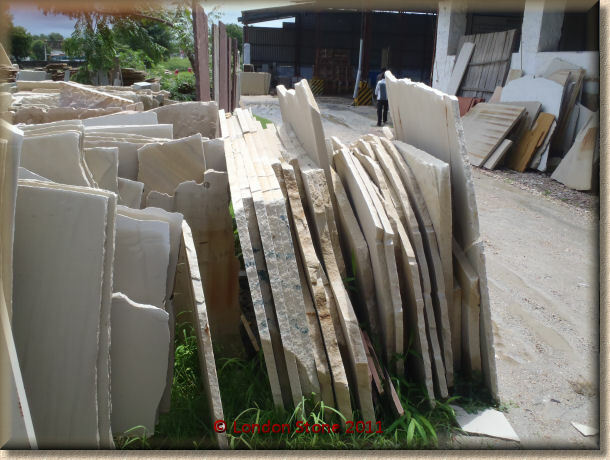 The monsoon season runs throughout August and is a real thorn in the side for Indian natural stone suppliers. Not only are the quarries waterlogged, which makes the extraction of stone impossible but the already unreliable Indian roads which are used to transport raw material from the remote quarries are turned into raging rivers. Factories and production facilities are also often waterlogged making production extremely difficult. 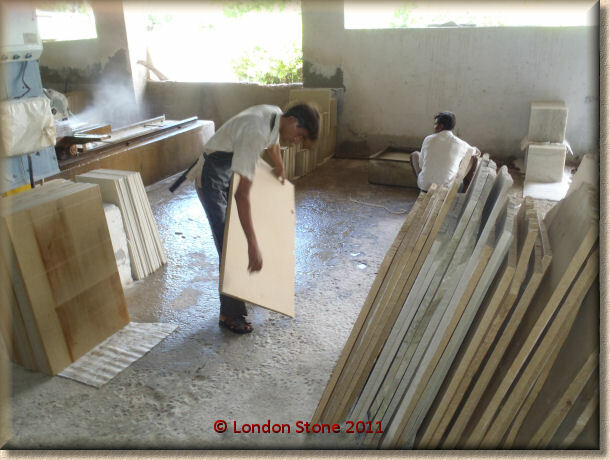 You can safely say that it is not much fun to be an Indian stone supplier in the monsoon. So why was I travelling in this period you may ask? I was advised by some of my more cautious suppliers that I should delay my trip until after September but in terms of sales, August is historically a quiet month for UK stone suppliers so I thought I would just take my chances and get myself over there. 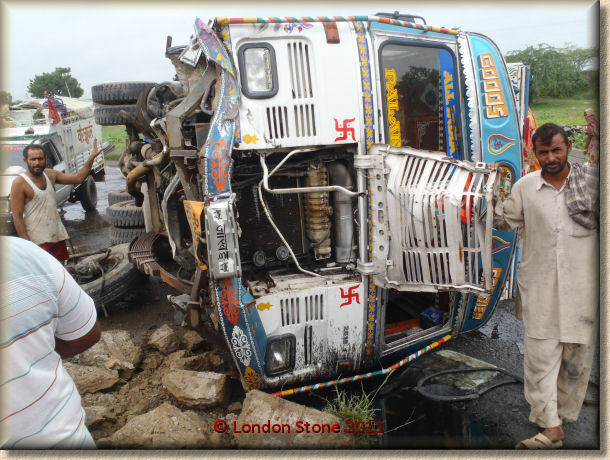 We were travelling down to South West Rajasthan for a very specific purpose. We were going to a city seven hours drive south west of Jaipur and which is luckily served by a decent highway for the majority of the journey. On the journey we suddenly hit traffic. We were wondering what was causing the traffic when we came across this scene of carnage. 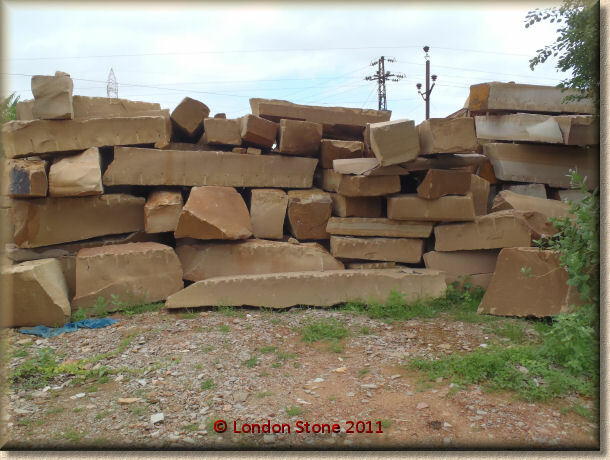 Kota brown limestone comes from this region of Rajasthan and is becoming a difficult stone to source. 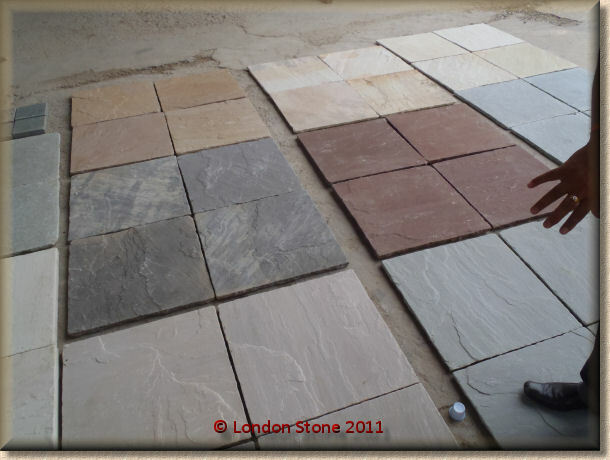 Like black sandstone, kota brown is becoming a scarce commodity in India. This results in increased prices and varying quality and colour variation. 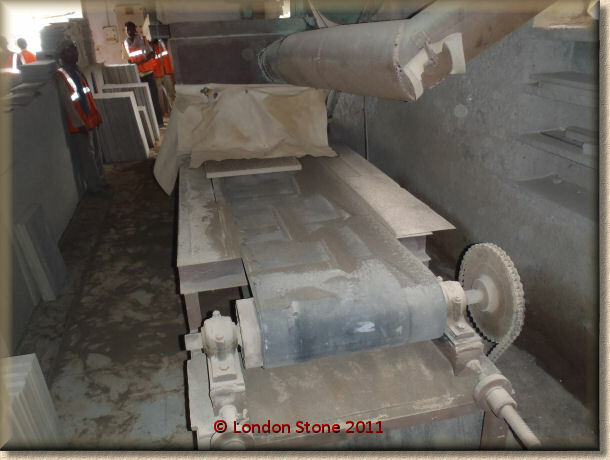 As the main seam of stone runs out mine owners are forced to "widen the net" in their search for fresh raw material and this results in the characteristics of the stone changing. A perfect example of this is raj green. Anyone who has experience of this stone five years ago will know that the material we now call raj green is a mixture of greens, browns, greys and pinks. This has led to many suppliers renaming the stone raj blend or raj mix. It's quite a common thing for customers to point out that raj green is not green. It's still raj green, just not as we used to know it. The purpose of the visit was to sit down with the suppliers and set colour parameters which the suppliers could achieve without upsetting the flow of deliveries. 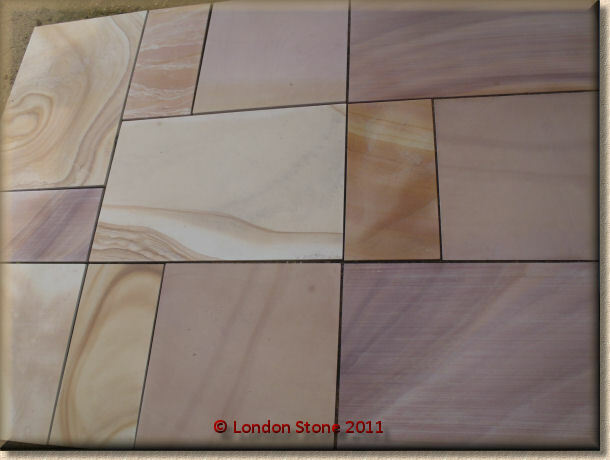 We compromised on accepting that 25% of the stone would have more colour variation than what we would have liked. I walked away reasonably happy because the factory owner was initially pushing us to accept 50% colour variation. 50% would have been far too much and would have resembled the rainbow sandstone that is unfortunately becoming popular in the UK. While we were there we put our name (literally, we got a marker pen and wrote "London Stone" on the slabs in capital letters) on quite a few large slabs which we liked the look of and asked for them to be set aside and packed. 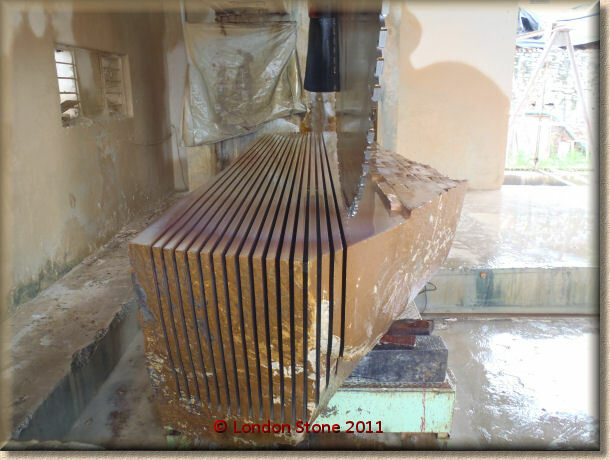 With the investments in machinery we have made back in London we are always on the lookout for large slabs which we can cut into step treads and landing stones. 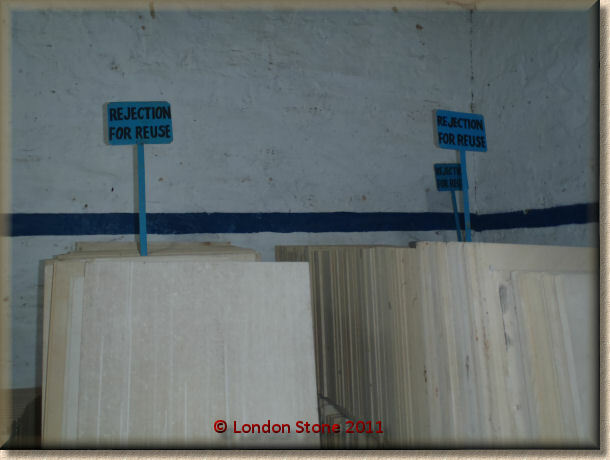 The factory owner was trying to convince me that while a few of the slabs did not look right in colour he could easily remove a layer of stone to get the correct colour we were looking for. I did not want to take his word for it and asked him to prove it. One word to his foreman and three skilled stone masons were mauling the monster slab out of the stack so they could set about it with their chisels. Within about 3-4 minutes they had stripped away a seam of stone to reveal a perfect colour match. I had seen this process many times before but it is still a real pleasure to watch. A little tip if anyone is ever using reclaimed York stone. If you find a piece which is thick enough and has 2 good sides, it is well worth getting a hammer and chisel out and splitting the stone into two pieces. 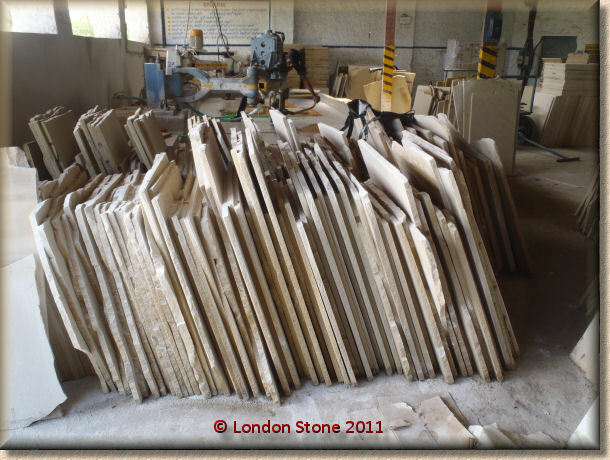 It is easily done and with the cost of reclaimed York stone what it is today, you will save a few quid. We were happy with our work for the day and were now looking to get to our next destination. I can't reveal the destination of the next supplier as he is my number one Indian supplier and we are currently the only company in the UK who work with this company. It was about a six hour drive to the next supplier. It had been raining heavily all day and the roads were like rivers. 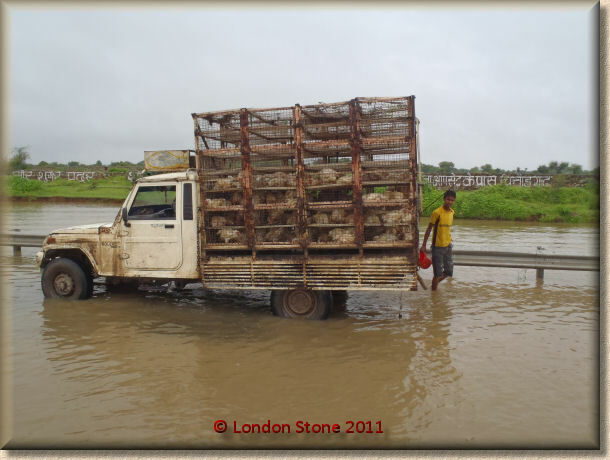 This truck carrying live chickens had stopped in one of the huge puddles and taken the opportunity to wash down the lorry and give the chickens a drink. It's good to see that the Indians are as resourceful as ever. We rose at 8am to meet up with our supplier and his family for breakfast. We had a lot to discuss with the suppliers and we were eager to get things wrapped up before 3pm so we could drive to Kota in the relative safety of daylight. 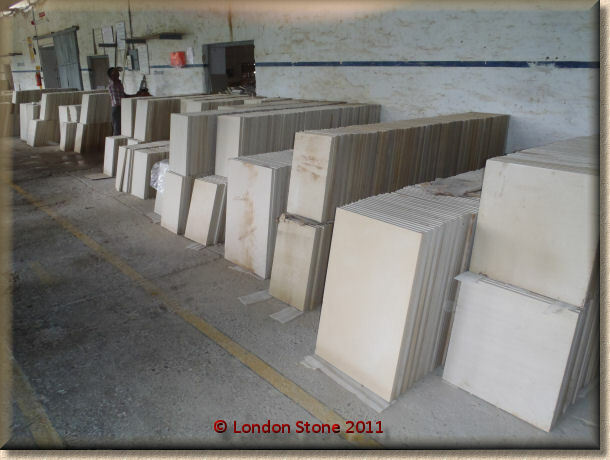 After a very unusual, but tasty breakfast we headed down to my suppliers factory to look at the sawn sandstone production facilities. 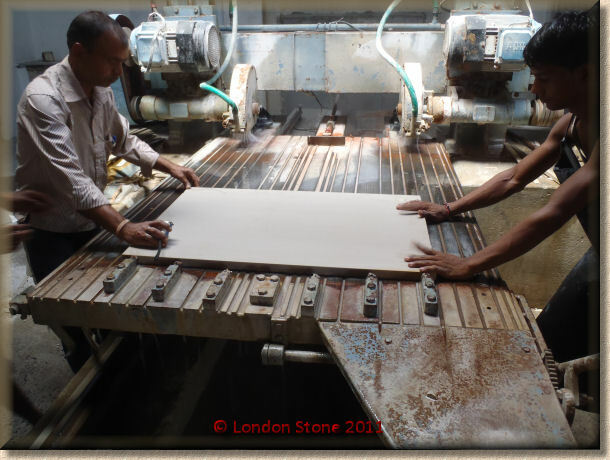 I was accompanied on this trip to India by Laura, our company buyer and I was very keen for her to see the whole process behind the production of sawn sandstone (this was Laura's first trip to India). 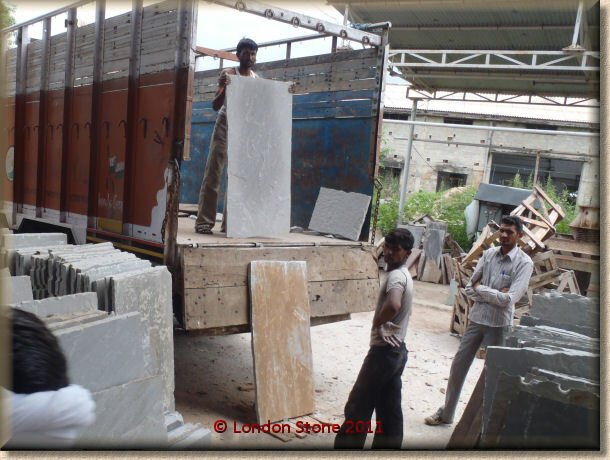 Large slabs of sawn sandstone scant are delivered and stored at my suppliers factory. The large slabs are then cut by hand too slightly over size of the 600 series which we take the paving in. These pieces are then stacked in the factory awaiting the next stage. The next stage is for the slabs to be polished to remove any marks. Rough slabs often have marks and imperfections so these slabs need to be polished down to remove these marks. The material is then stacked while it dries out. Damp material is never packed for export. The next stage is to pack the material up into strong wooden crates. My camera had a bit of a fit here, so apologies for the poor quality of the photographs. It was really interesting to see some of the other packing standards that my supplier used. 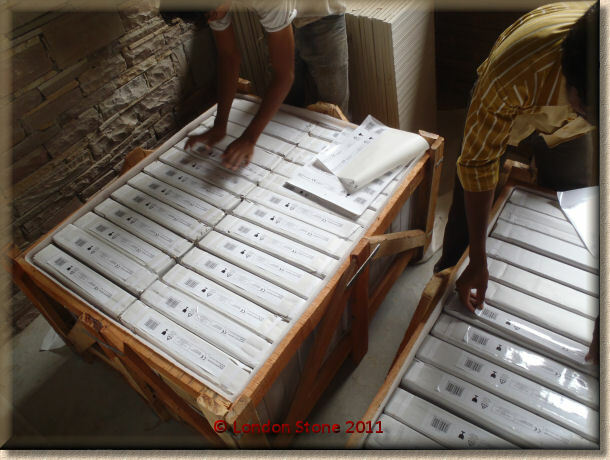 My supplier ships stone to Australia, America and Eastern Europe and every company/country has different standards of packaging. Generally the Indian suppliers will accommodate any type of packaging that you specify. 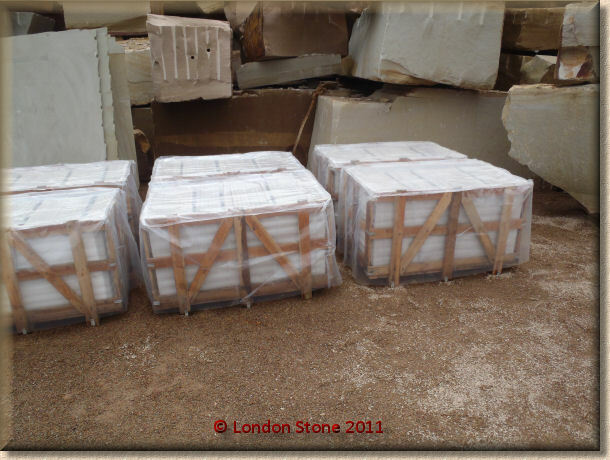 It's a really important part of production, good packaging will ensure that material that's been moved halfway around the world will get to the customer in perfect condition, however even with all the effort that has gone in here there are still many opportunities along the way for stone to get damaged. 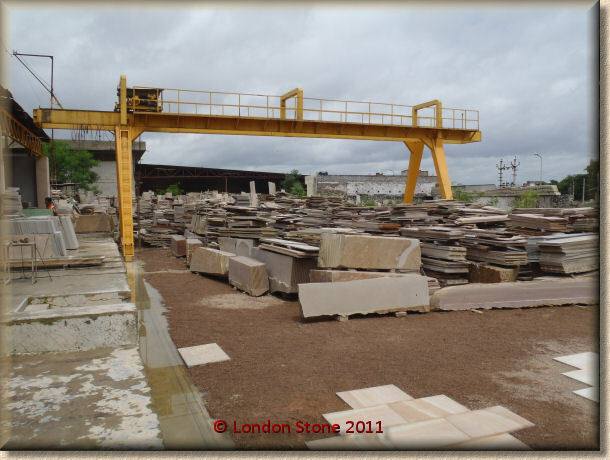 It is impossible to guarantee that all stone will reach the UK in perfect condition but you can still try to minimise the risk as much as possible. While we are on the subject of packaging we had a few small issues with the packaging of our sawn sandstone and we were keen to iron them out with the suppliers face to face. 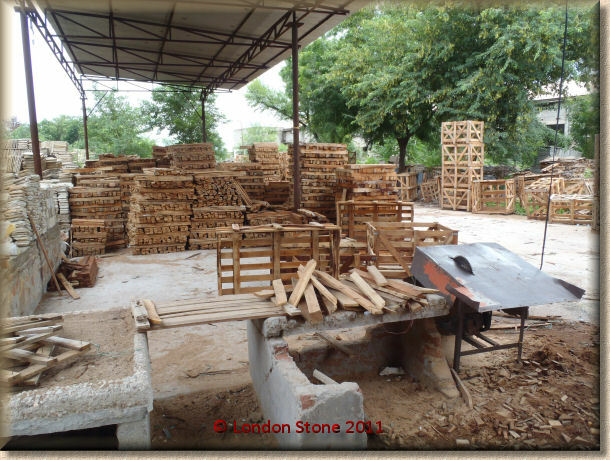 We had a situation where we have been seeing one or two slabs damaged per crate. The damage in this case was caused by the nails used to fix the crates together. The nails always protrude a little bit and they rub against the stone in transit. The nails can also rust and the rust can make a real mess of the stone. We need a situation where contact between nail and stone was a physical impossibility. 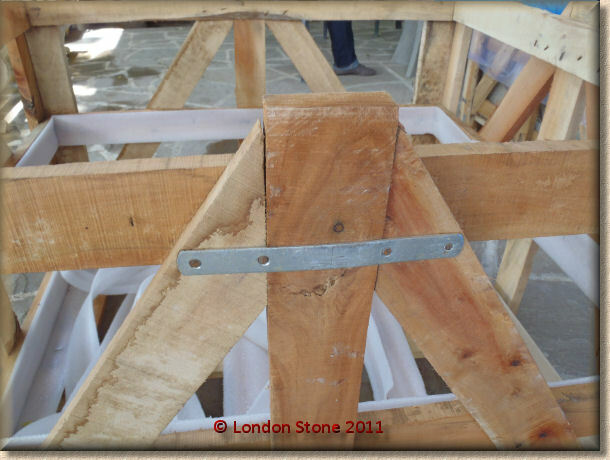 As can be seen on the pictures nails stick through the timber on the top, middle and bottom runners. 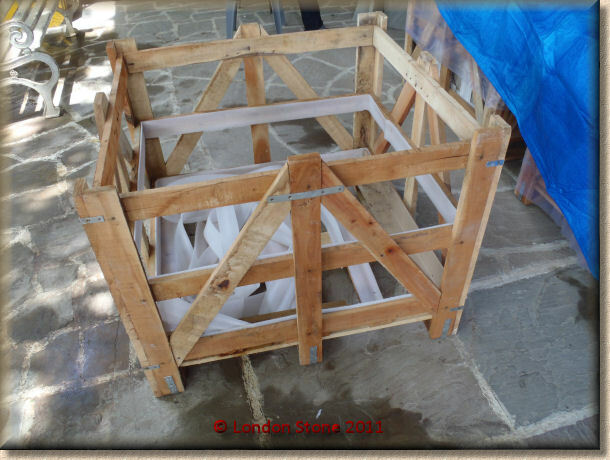 We had in the past tried to use foam around the inside of the crates to protect the stone from the nails but it did not make any difference. We eventually decided that we would glue strips of plywood around the insides of the crates. It would cost us an extra £2 per crate to do this but it will be money well spent. 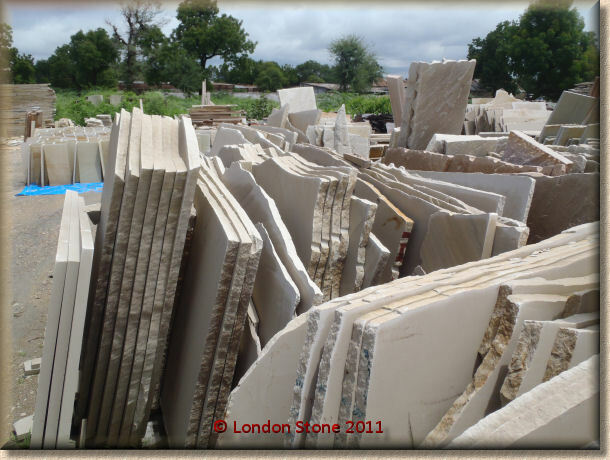 Not only will it save us the cost of the damaged stone but also the cost of going to site to replace the stone. We also needed to make the crates stronger. 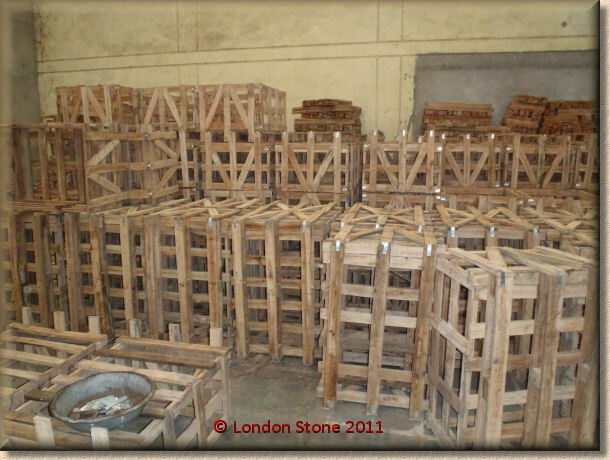 One of the main causes of damage to stone is poorly constructed crates. Once crates start to lean over stone can then get damaged easily. We have opted now for these stronger brackets to hold the crates together. Again it would cost about £2 per crate but it will be worth the cost. Sorry to bore you with all the crate details but it goes to show that it take a lot of thought and effort into getting the product just right for export. Not ashamed to say that I find the subject of crates and packaging absolutely fascinating. After arriving in Kota we had a meal with our supplier who we were spending the morning with tomorrow and we were off to bed. We were picked up from the hotel by our supplier at 9am and driven straight to his main factory. As soon as we got there the supplier wasted no time in showing us some new products. Two of the products offered can be seen in the following pictures. I politely declined as these products were too busy and had far too much colour variation than we like. 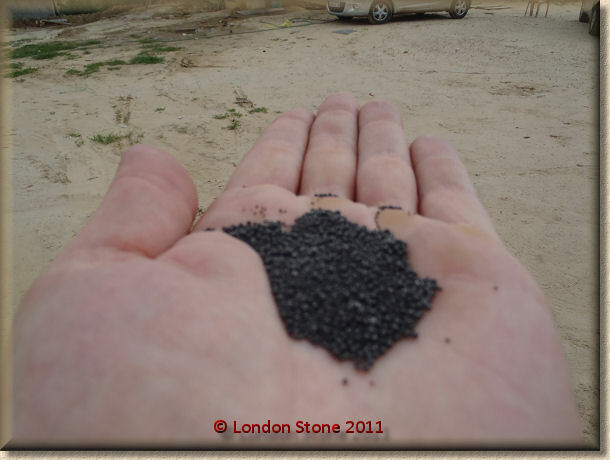 These are the small particles which are use to shot blast the surface of the paving. Shot blasting is done for a couple of reasons. 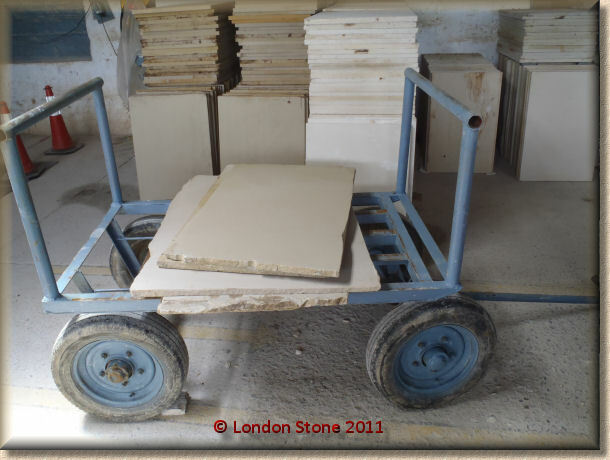 The main reason is that when some stones are sawn the surface is slippy. 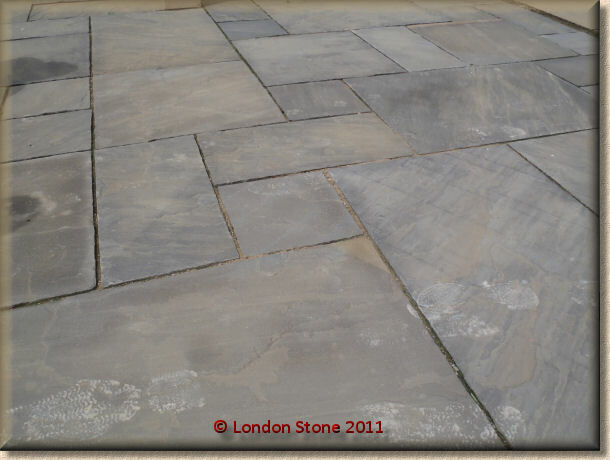 Shot blasting adds texture to the paving and also improves the look of the surface of the stone. These are bull nosed coping stones. We are still debating on whether or not to purchase any of these. 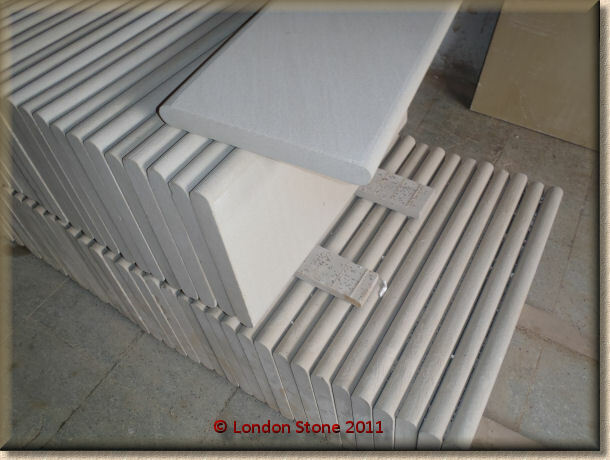 In my experience coping stones are often more of a bespoke item and are difficult to package into an off the shelf product. 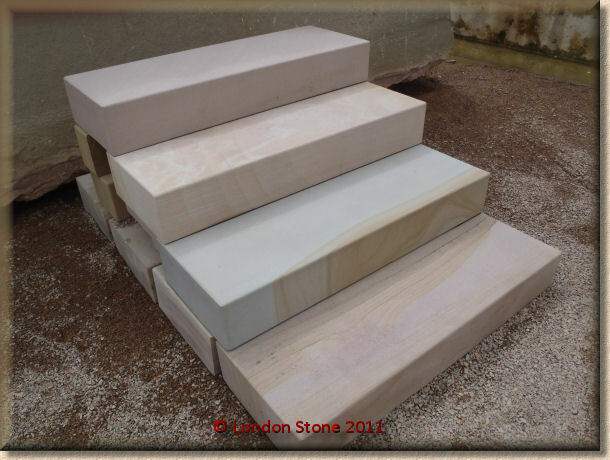 We were also shown these solid sawn sandstone steps. I really like the look of them but they are extremely heavy and it would be really difficult to manually handle them around a site. Most suppliers are making their own crates now. I took a quick peek at my supplier's stockpile of crates and raw material. No smoking in this area please. Any supplier worth his salt will have factory stuffing facilities. 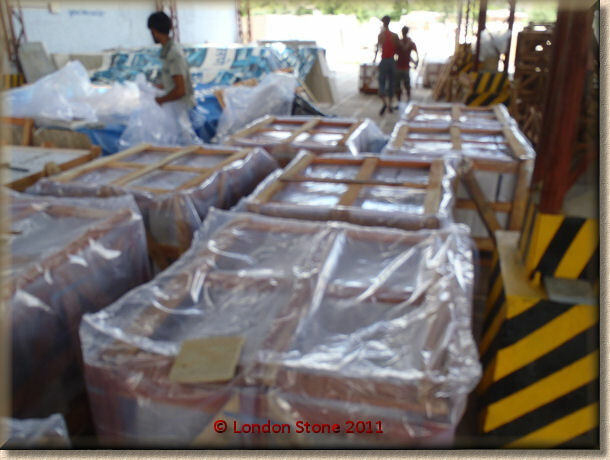 Lorries can then be driven into the supplier's yard and loaded up by the suppliers own staff, who actually care that the material is packed correctly, unlike the staff who work at Mundra port and don't give a monkey's about the material they are stuffing. The container lorries are then driven to the ICD (inland container depot) in Kota where they are loaded onto huge cargo trains which are bound for Mundra port. This is a much safer method of transport than by road. 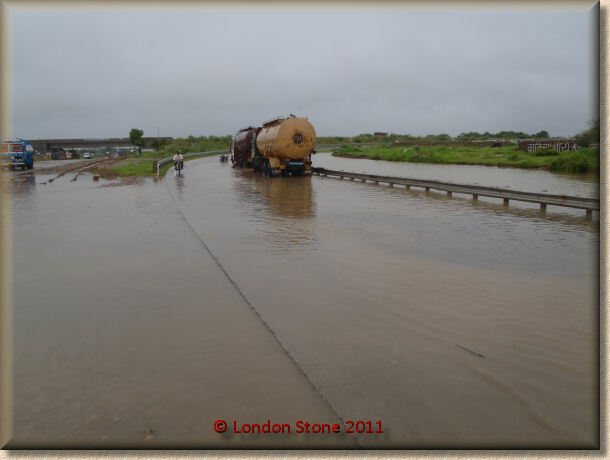 Cargo transported to Mundra by road takes 2-3 days and the state of the roads and the standard of driving means that stone transported by road has a much greater chance of being damaged than stone which is transported by train. We had finished with this supplier and were now getting a lift back to Jaipur to meet our final supplier and spend half a day relaxing before flying back to the UK. 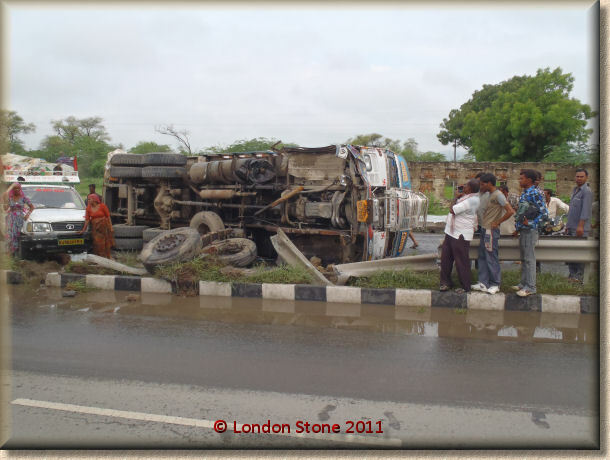 The drive from Kota to Jaipur takes about 7 hours and is one of the worst car journeys I have ever experienced. 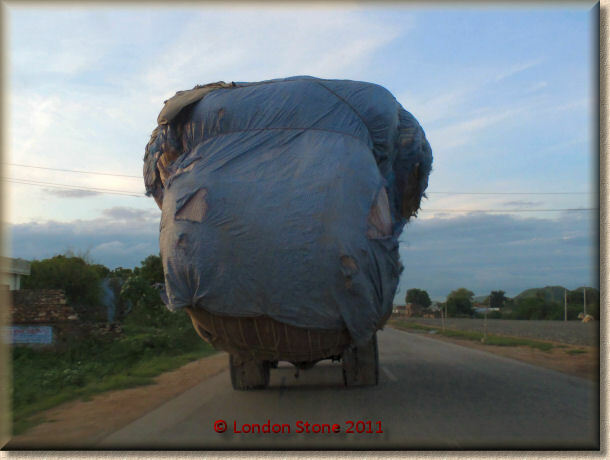 (The worst journey I have ever taken was driving from The Cambodian Thai border to the Cambodian city of Siem Reap. It took about ten hours and the road was no better than a farm track. It was unbearably hot and because the bus had no air con we had to open all the windows. When we arrived at our destination everyone in the coach was covered head to toe in red dust). We stopped at Dominos for a pizza before we left for Jaipur. There is not much to eat on the road so we decided to stock up on palatable food while we had the chance. These two guys are employed by the shopping centre to make sure that nobody parks in this area. Look closely and you will see they are holding large sticks. I was a bit concerned because we were parked up in the area they were supposed to be protecting, however my supplier assured me that we would be ok. I'm not sure what's worse. A £60 parking ticket in London, or a quick stick across the back to move you on. Neither? We finally arrived back in Jaipur at about 11pm. It felt really good to be back in civilisation. It's hard work travelling around Rajasthan. I am often ribbed by my work colleagues about my yearly "jolly" over to India. I wish it was a jolly, it's actually bloody hard work, with every day involving a 4- 7 hour car journeys. I was really looking forward to this day. We were visiting a supplier who was based in the Jaipur area. The day involves just a couple of ½ hour car journeys on tarmacked roads, luxury. 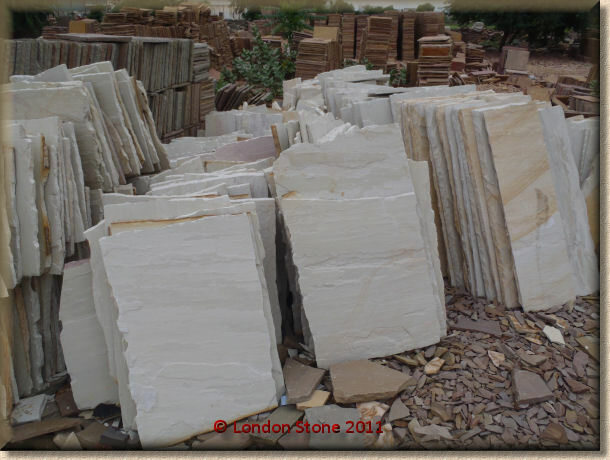 This supplier is one of the major Indian stone suppliers and while I have known him for five years we had never really developed a strong business relationship. 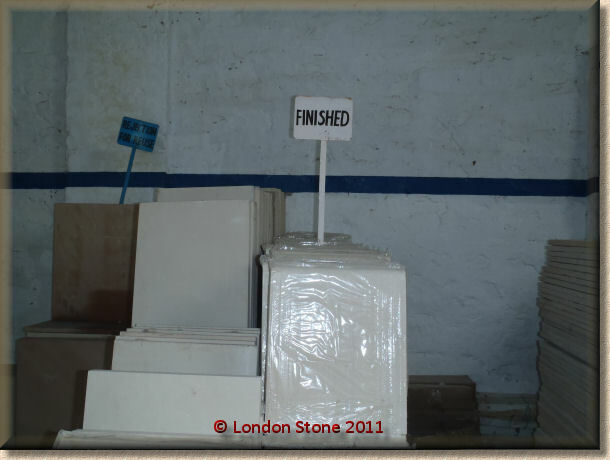 London Stone faced problems in 2011 with out of stock items. We were hoping that bigger suppliers would be able to cope with the volume of orders we would be placing. That was the plan anyway, nothing is ever quite so straightforward in India. The supplier's stock yard is huge and probably the biggest one I have ever seen in India. My supplier was eager to show us a new product he wanted us to import. The product is similar to fossil mint but without all the colour variation. The colour is almost a pure white, but unlike fossil mint this material is rock hard. Many people are reluctant to use fossil mint because of how soft it is, I know Tony McC has a particular dislike to the Gwalior sandstones because of how soft they are. Tony: Soft as Sh.... as we say up t'North! We then headed over to the main factory area to see the supplier's state of the art tumbling facilities. The tumbling machines here are very modern and well maintained. 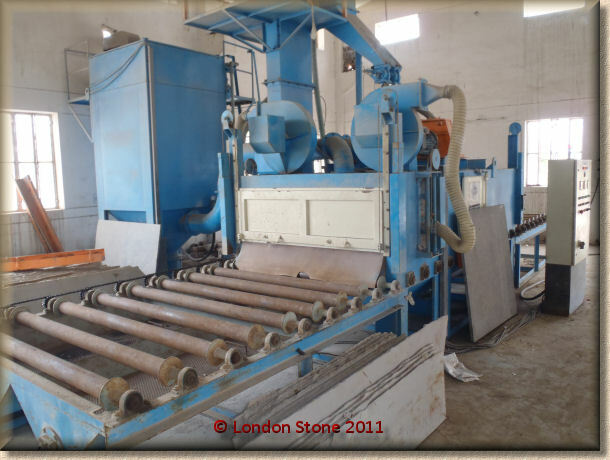 This supplier was the first supplier in India to produce tumbling machines capable of tumbling 900x600 size. Here are some pictures of the tumbling area. 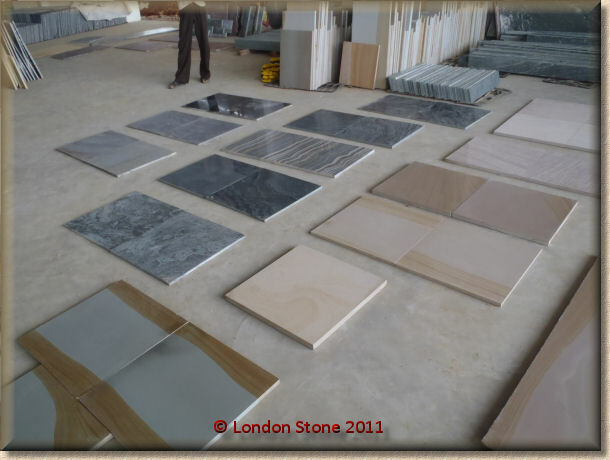 Looking around at the quality of the material, it was fantastic and we saw enough to convince us to place immediate orders on our return to London. 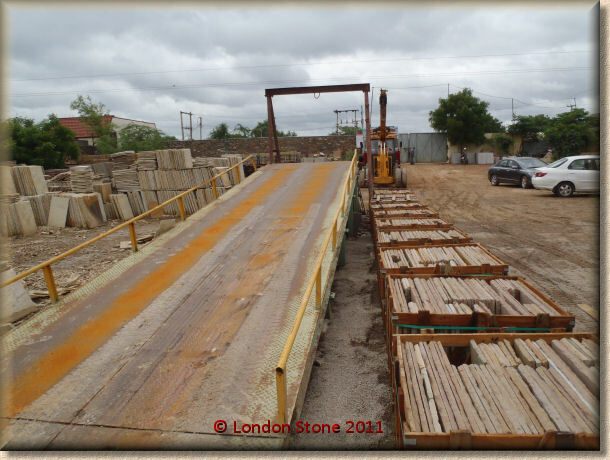 We were now headed down to the supplier's sawn paving factory but before we left we had to do the obligatory viewing of the suppliers complete product range of hand cut materials. We were now headed down to the supplier's sawn paving factory. This factory was ridiculously big and was still nowhere near full capacity. 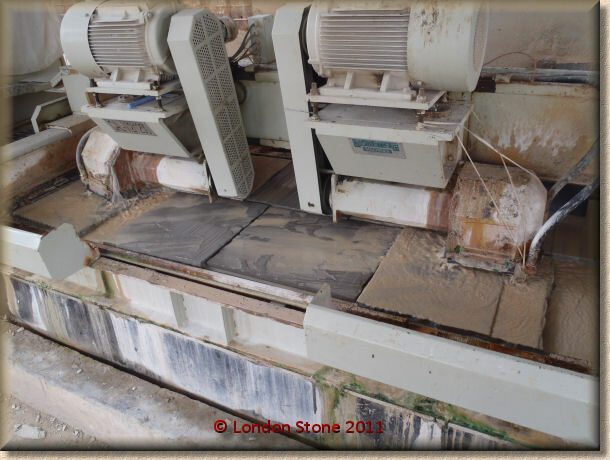 When I got there I saw a monster block saw cutting up huge blocks of slate into slabs. Although I have seen this process on dozens of occasions it still never fails to interest me. 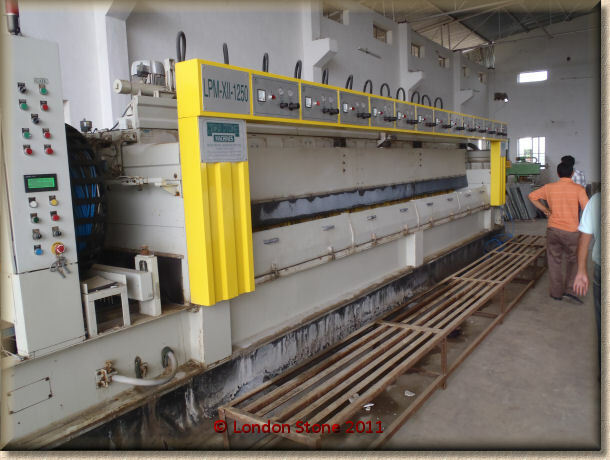 This supplier has invested millions of pounds into buying state of the art modern machinery. This shot blasting machine makes the one detailed earlier in the blog look tiny in comparison. It is capable of shot blasting slabs up to 1500mm wide, where as the machine we saw earlier goes to a maximum width of 600. Different level of machinery. The supplier then showed me all the new products that could be produced by the new polishing machine. I was not too impressed by the majority of them. Indian and Uk taste is like chalk and cheese and you are constantly being shown products which while being visibly impressive would not be suitable for the UK market. One product I did like was this Indian slate available in a six side's sawn finish. The product is not exactly brand new but it has not yet reached the point where it has become mainstream. 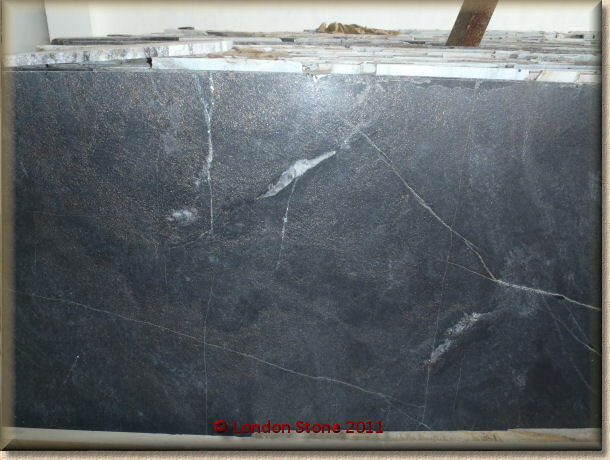 One of the main advantages of this slate is that it can be sawn on all six sides making it available in large slabs. 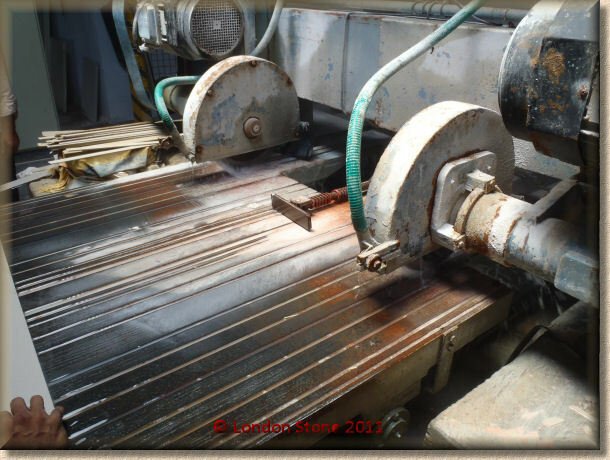 Most slate is formed in layers so the majority of it cannot be sawn six sides. That was it for this year. Not a great deal new from the previous visit really but we found a few new products and made some good improvements to the quality of the packaging of some of our stones. It was quite enjoyable to travel in the monsoon season for a change. The temperature is much lower and we seemed to hit the ground running work wise. 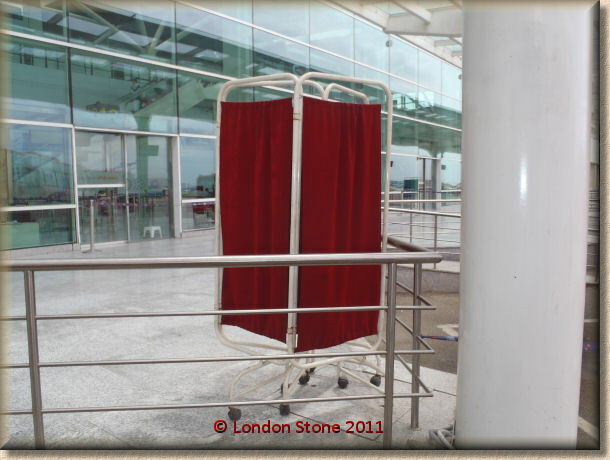 Usually it can take a couple of days for your body to adjust to the temperature in India. It was also interesting to see the effect that the monsoon has on the production in India. It's a common occurrence for my eyes to glaze over when I get a call from a supplier telling me that a container has been delayed due to the factory being flooded. On this trip I actually saw a couple of factories flooded with my own eyes, so I will be a little more sympathetic if I hear this story from any suppliers in the future. One thing that has not changed is the cow, they till rule the roost over here and I will leave you with a couple of pictures of the sheer brazenness of these cows. 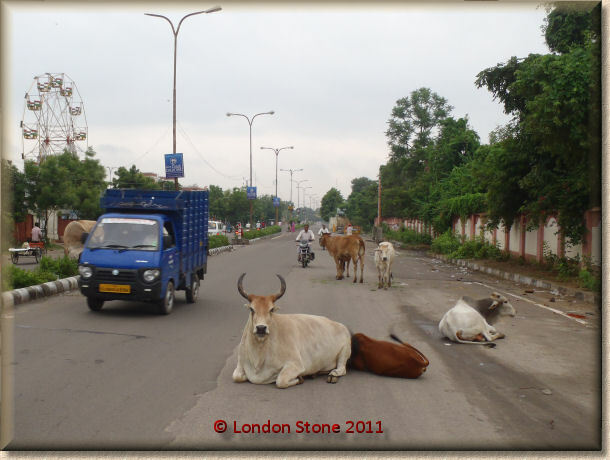 Note the cow in the video chilling on the inside lane of the highway. We actually had to slow the car down and go around the cow. It does not even flinch !